I can often be found browsing the 3 for £10 on Amazon, so when I saw a few bloggers reading Beneath the Surface it miraculously found its way into my basket. Feeling a bit guilty about buying yet more books, I wrapped it up and gave it as a gift to my Mam ensuring that I would get it to read it too - RESULT! There was method in my madness: my Mam has a medical background, having worked in various parts of the health service for all of her working life, so I knew she would appreciate this book. She didn't just appreciate it, she LOVED it and plans to pass it on to family and friends. Holly lost touch with her good friend, Jess, when Holly went to London to pursue her career in journalism. When Holly finds herself back in her hometown, she thinks she has all the time in the world to reconnect with Jess, but then Jess and her husband are found murdered by their own son, Dean. Nobody can understand what drove Dean to commit such an act, it seems so out of character for him. So Holly starts to investigate but she doesn't realise how far this web reaches and that some people will do ANYTHING to stop the truth getting out. Beneath the Surface is my first Sibel Hodge book but I will definitely be looking at her back catalogue. I love books with even a grain of truth in them, and knowing a bit about pharmaceutical companies, I'm sure that Beneath the Surface has a whole bushel of truth in it. We know there is big money in pharmaceuticals, and I'm not for one minute suggesting that companies would go to the extremes in Beneath the Surface, but when the board is pressurised into making profit, when do morals outweigh money? 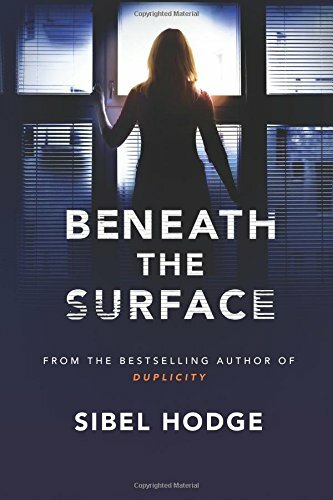 Beneath the Surface is a very clever thriller that leaves you with so much food for thought. How many of us walk out of the doctors' surgery with that magical green slip in our hand? It promises to make us feel better and we put 100% trust in the doctor who gave it to us, but we need to remember that our slip of green turns into another slip of green with the Queen's head on it once we 'cash it in'. What many people don't realise is that incentives are offered for doctors to prescribe certain drugs. What I didn't realise is that doctors could prescribe 'off-label' so that if a drug hasn't been recommended for a particular age group, they can legally prescribe it to this untested age group. This book isn't necessarily about Prozac but I have heard about the effects of Prozac and find it amazing that a common side effect of anti-depressant drugs is suicidal thoughts. Surely then, it is the wrong drug to administer to a person already depressed and considering suicide? Then again, if the doctor gets an all-expenses trip to Barbados for prescribing the drug, why wouldn't they prescribe it to all and sundry? I remember a few years ago when everyone seemed to come away from the doctors with a prescription for codeine. Now we see news articles about the addictive nature of codeine and I wonder who should be held accountable. The doctors for prescribing it or the pharmaceutical reps for 'pushing' it? I've digressed from the book slightly, but you can see how thought-provoking I found Beneath the Surface to be. It's a cracking thriller with that little bit extra that makes it a book I will definitely remember and continually recommend.